Chemtech Alloys accuracy engineered Steel Couplings are in high demand and widely used in various industries. 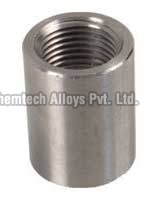 At Chemtech alloys we are capable of manufacturing and exporting steel couplings by using high grade steel. Steel couplings that we manufacture are priced reasonably and meet the market requirements.We are Leading Stainless Steel Coupling Manufacturers In Mumbai.